For purchases made with a credit card through our online store we ship items to the addresses in USA, Canada, Mexico, Puerto Rico and around the world, excluding several regions. 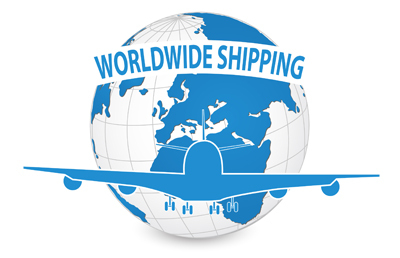 We use third party shipper to deliver products to other countries WORLDWIDE, such as some countries of Eastern Europe, Africa and Middle East. For details see International Shipping below. Most items in stock are shipped within 1-2 days. Crystal Quest products are shipped in 2-4 business days, except for large items, Bottle-less Water Coolers and units that require customization. Products that require custom IN/OUT sizes, cartridges other than stock cartridges or other customizations may be delayed for up to 1 week or more. FW- FilterWater Coolers are shipped within 2 days, while all other Bottleless Water Coolers take at least 4 business days after order was placed, and generally take 2 weeks from the date of the order to arrive. Large orders such as Bottleless Water Coolers or Whole house filtration systems can be only shipped via Ground service. There is no rush, 2nd day or air deliveries for these! Please read Water Cooler Delivery guide before ordering. There may be an additional shipping charges for custom units, heavy items, or when shipped outside continental US. *We offer free ground shipping on orders over $99 in lower 48 states of United States, excluding Commercial, Industrial , custom-built filtration systems and Filtered Water Coolers. Water coolers have a "low cost flat rate" promotion. On larger shipments, this offer includes ground shipping via company of our choice and "curb" or 1st floor delivery only. Shipping charges are non-refundable. Actual shipping charges will be subtracted from refunds on products that received "Free Shipping" promotion, except for products that have defects. Orders are shipped via FedEx, US Postal Service, UPS or regional carriers, depending on weight and destination. Fedex, USPS and UPS Ground deliveries to Home or Business addresses for orders under $500 may be sent with NO SIGNATURE REQUIRED - this means that Fedex or UPS will leave package at your door or in convenient location when noone is present at delivery time. If you require a signature, please add a Note during checkout process! You can login into your account on our site to track status of your order. It generally takes 2-6 additional business days for an order to arrive to destination in U.S.after it was shipped. FilterWater.com is not responsible for any merchandise lost or stolen through any mail parcel service, including but not limited to USPS, UPS, Fedex, and/or any freight companies. It takes 10 business days from the day we receive a check for it to clear through the bank. Because of this expect 2-3 weeks delay between the date you place a check order through our system and the date your item is shipped. We also accept Money Orders, orders paid with money order are processed the same day we receive money order. Shipping rates are subject to change without a notice. Although we try to update this information regularly, actual shipping rates may be different from what you see below. For example , there may be additional destination charges for the West Coast states such as CA, WA and OR. You can see an estimated Shipping Calculator on a Shopping Cart page. Add all products you are looking to order to the cart, then scroll down the Cart page. Shipping charges there will almost always match to an actual shipping prices, with minor exceptions. We do not ship to international P.O. Boxes. It is possible to get your purchase shipped to a US P.O. Box if you have absolutely no other way to receive your purchase (for instance, if you have a military address). In this case your purchase will be shipped via US Postal Service Ground (no Overnight, 2nd Day or other carrier shipments to P.O. Boxes). We are not responsible for shipment tracking, lost, stolen or damaged merchandise shipped to a P.O. Box. We now ship worldwide! We can ship your order direct to most countries, excluding some Asian countries, Africa and Eastern Europe. If your country is in our direct shipping list (USA, Mexico, Canada, Caribbean, Australia, Western Europe, Singapore, Japan and others), we will accept credit and debit card payments, and will ship orders directly to your destination. 1) send us a payment via PayPal, a money order or wire transfer. Please contact us with your country and address information for shipping costs and payment arrangements. We will ship most small orders via U.S. Postal Service in order to limit or eliminate border fees. However, Customer is responsible for ALL SHIPPING CHARGES, including shipping and any additional fees that may occur such as broker fees, duties, government taxes etc. associated with import/export process.